College students, join us at the home of Judson and Traci Jones for brunch following the 11 am service the first Sunday of the month. We hope this to be an opportunity to find and connect with other college students and to share a meal together! The Joneses live within five minutes of Trinity Westside. Email Addie Jones for directions and details. Please register here. Trinity Eastside, 630 E. Lake Dr.
Due to the Super Bowl, there will be no 6pm service on the Westside on Sunday, 2/3. Teens & Technology is a 2-night class where we will discuss the role of technology in the world we live in, particularly it's role in the lives of teenagers. The first class is geared toward parents to discuss how to talk with teens about technology. The second class is geared toward both parents and teens to workshop how to create healthy boundaries around technology. Please register here. 7:30pm in the Westside Sanctuary. Park in our lots or on the street that eve please. Children welcome though no childcare provided. Worship is a key component to being formed into Christ’s likeness. Come worship through contemplative music, prayer and meditation. This is an opportunity to focus our attention on how God is moving in our lives. Join us on the first Thursday of the month (unless otherwise noted) for a time of fellowship with other moms in our community. We’ll gather together, with our children, as a group of moms walking motherhood out. 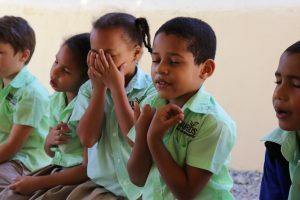 This will serve as an opportunity for kids to grow in community together, as well as provide time for moms to connect. Come offer and receive support and encouragement in this motherhood journey. Please register here. Trinity Westside, 2260 Defoor Hills Rd. The Newcomers Meeting will take place after the 11am service in the chapel. New to this community? If you want to get connected this is a great way to begin. Come hear a short talk on Trinity’s backstory, our purpose, mission, and values. You will also learn about ways to get connected to the life of the church and have the opportunity to meet other newcomers as well as church staff. Children welcome though no childcare provided. Join us on the second Sunday of every month (unless otherwise noted) for a churchwide family dinner. This is a fantastic way to meet new people and live life together as a new Northside parish. We’ll gather in the Skyland dining room immediately following the 4pm service for dinner. $5/per adult. Kids eat free. If you’d like, please feel free to bring a side or dessert to share! This is a way for evening service attenders to enjoy a meal together! We will serve dinner in the Backyard if weather permits, otherwise, we will meet in the lower cafe. Trinity youth will watch your kids from 6:00-8:30pm on Valentine's Day while you enjoy a lovey dovey dinner date. This event is to raise support for Trinity Youth's summer trip to Ecuador so we invite you to donate toward this exciting cause. Please register here. Come explore Buford Highway with Trinity Northside as we try out a new restaurant on the 4th Sunday of each month, immediately following our 4pm Service. Restaurant location will be announced each month during the service. Membership at Trinity means that we are committed to participating in the mission and values of the church. If you are a member at Trinity, we look forward to seeing you there. Members, park in our lots or on the street that evening. Children are welcome, please register below for childcare. Please register for childcare by Wednesday, 2/20. 4th and 5th Grade Kids are invited to monthly Westside game nights. We play games, eat pizza, and have a lot of fun together. It’s a great opportunity for our 4th and 5th grade kids to connect and form community. For more details and to RSVP, please email Millie. 4th and 5th Grade Kids are invited to monthly Eastside game nights. We play games, eat pizza, and have a lot of fun together. It’s a great opportunity for our 4th and 5th grade kids to connect and form community. For more details and to RSVP, email Beth. The Newcomers meeting will take place after the 11:45 service in the sanctuary. New to this community? If you want to get connected this is a great way to begin. Come hear a short talk on Trinity’s backstory, our purpose, mission, and values. You will also learn about ways to get connected to the life of the church and have the opportunity to meet other newcomers as well as church staff. Children welcome though no childcare provided. We invite you to come share a meal with other twenty-somethings at Trinity. Our time together will include ways to engage in the life of the church, as well as the opportunity to meet others in the same stage of life. Please register here. Shrove Tuesday or “Pancake Day” is the celebratory feast day that precedes Ash Wednesday and the beginning of the penitential season of Lent. Join us in the Northside dining room (located at Skyland UMC) for a pancake dinner together. Children welcome. Please register here. Shrove Tuesday or “Pancake Day” is the celebratory feast day that precedes Ash Wednesday and the beginning of the penitential season of Lent. Join us on the Eastside for our annual for a pancake dinner. Children welcome. Please register here. We will come together on Ash Wednesday to worship in prayer, scripture, song and to be marked with palm ash as we focus our hearts on the season of Lent. We are having three services on the Eastside: 7am, 6pm, and 8pm. Childcare available for children 4 and under at the 6pm service, please register here. We will come together on Ash Wednesday to worship in prayer, scripture, song and to be marked with palm ash as we focus our hearts on the season of Lent. We are having three services on the Westside: 7am, 12pm, and 7pm. Children welcome, though no childcare provided. For 2nd-5th graders that either want to be baptized or want to affirm their baptism. This is a 2-session class (both sessions required) that explores the Bible, the character of God, and the basics of the Christian faith. Following the 4pm service in the Sanctuary. New to this community? If you want to get connected this is a great way to begin. Come hear a short talk on Trinity’s backstory, our purpose, mission, and values. You will also learn about ways to get connected to the life of the church and have the opportunity to meet other newcomers as well as church staff. Children welcome though no childcare provided. Lazarus offers this class as a way to equip people to interact, in a thoughtful and dignifying way, with those that are experiencing homelessness. In this short seminar Allison McGill, the founder of Lazarus, will share some insight into the true needs of the homeless community, discuss lessons learned through the years, and tell the story of how and why Lazarus was founded. Please register here by 3/17. For 2nd-5th graders that either want to be baptized or want to affirm their baptism. This class explores the Bible, the character of God, and the basics of the Christian faith. Please register here. This class takes place on 3/23 & 4/20 For 2nd-5th graders that either want to be baptized or want to affirm their baptism. This is a 2-session class (both sessions required) that explores the Bible, the character of God, and the basics of the Christian faith. Please register here. At Trinity, we have a desire to care for vulnerable children. This meeting is an invitation to come learn about ways to care for vulnerable children through fostering, adopting, or caring for those who are adopting or fostering. This meeting will have an opportunity for Q&A at the end. Please register here. Care teams are a way for our church to support and come around families who are adopting and fostering. These teams are made up of around 6-8 people who support a family through cooking meals, babysitting, helping with transportation, or any other ways that could serve the family. This training will equip care team members and is required to be a part of a team. Please register here. The Eastside Youth will gather on Saturday morning to eat pancakes and make art together. Email Ginny to RSVP. Membership at Trinity means that we are sustainably committed to serving & living out the purpose, mission & values of this church. If you are interested in becoming a member at Trinity, please attend this informative gathering. Childcare available upon request, please email Gypsy. Join us on Good Friday as we remember the self-giving love of God shown to us on the cross and pray for all who are in need of God’s mercy, comfort, and grace. Children welcome. Childcare provided for children under 4 at the 6pm service, please register here. Join us on Good Friday as we remember the self-giving love of God shown to us on the cross and pray for all who are in need of God’s mercy, comfort, and grace. Children welcome, childcare provided for children under 4. Register here for childcare by April 14th. Bring your baskets and join us in celebrating the Easter Season with some family fun in the backyard! Please register to ensure we have enough eggs for all of our Trinity Kids and guests! Please register here. The Great Vigil of Easter is one of the most ancient and unique services of the entire Christian year, moving from the darkness of Lent into the joyful light of the Resurrection, all within a single service. Join us as we keep the Easter Feast together! Children are welcome and encouraged to participate, though no childcare will be provided for this service. The Westside will hold Easter services at 8:15am, 10am, 11:45am, and 6pm Join us in worshipping the Risen Christ on Easter Sunday! The Eastside will hold Easter services at 8:15am, 10am, 11:45am, and 6pm Join us in worshipping the Risen Christ on Easter Sunday! The Northside's Easter service will take place at 4pm Join us in worshipping the Risen Christ on Easter Sunday!